After many national energy flow balances, some of which I have presented here on the blog, energy flow balances on a regional level are now coming out of France. 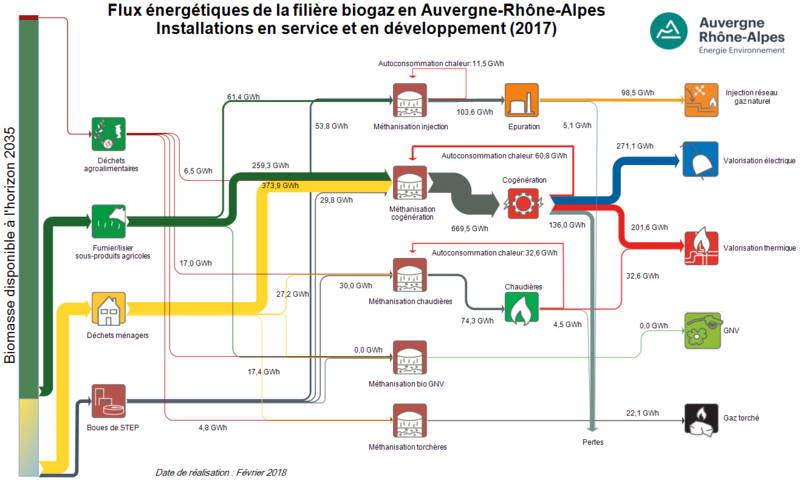 Benoît Thévard who writes on the ‘Avenir Sans Petrol’ blog (a French version of Peak Oil) has an interesting post on ‘Un scénario de transition énergétique citoyen pour la Région Centre’ (translated: An civil energy transition scenario for the Central Region). It summarizes a report published March 2015 by VEN Virage Energie Centre-Val de Loire. Flows are in TWh. Production of nuclear energy comes with huge losses (efficiency approx. 35%). The main consumers in the region are residential and services, followed by transport. Energy consumption in industry plays a comparably smaller role in the region. The report explains that the region is vast and not densely populated and houses are older and larger on average compared to other regions (“le territoire est vaste et peu dense et les logements sont anciens et sont plus grands”). Another report mentioned on p. 21 calls the region énergívore (a beautiful word I read for the first time). The other Sankey diagram on page 37 shows a nuclear-free and almost fossil fuel free scenario for 2050. Overall consumption is drastically reduced (2009 energy consumption approximately 75 TWh, 2050 energy consumption scenario 32,4 TWh). The scenario relies on a diversification of energy sources with an emphasis on wind energy and biogas. The region would hardly export any energy in 2050 anymore. Just like for the India 2031 scenario I discussed in my last post, the two Sankey diagrams shouldn’t be compared directly, since the scale is different. I think this a remarkable piece of information for the public. And not only because it contains Sankey diagrams. It is beautifully non-academic and inspiring to read. Those of you who understand French should have a look. Ate your muesli this morning? I have talked about a cereals Sankey diagram by INRIA Grenoble a couple of weeks ago in this post. Here are two more Sankey diagrams from the underlying article ‘Etude des flux de céréales à l’echelle locale: Exemples en Rhône-Alpes, en Isère et dans le SCOT de Grenoble’ by J. Courtonne, J. Alapetite, P. Longaretti, D. Dupré. Here is the same cereals process chain “translated” into a water footprint. Unit is million cubic metres of water consumed. A very clear structure in both diagrams with three columns: grains production, transformation and final products. Choice of color corresponds to the topic. A research group from INRIA Grenoble engineering school has set up a website for visualization of environmental data. Sankey diagrams are one available visualization option. The below is a sample provided on the website. 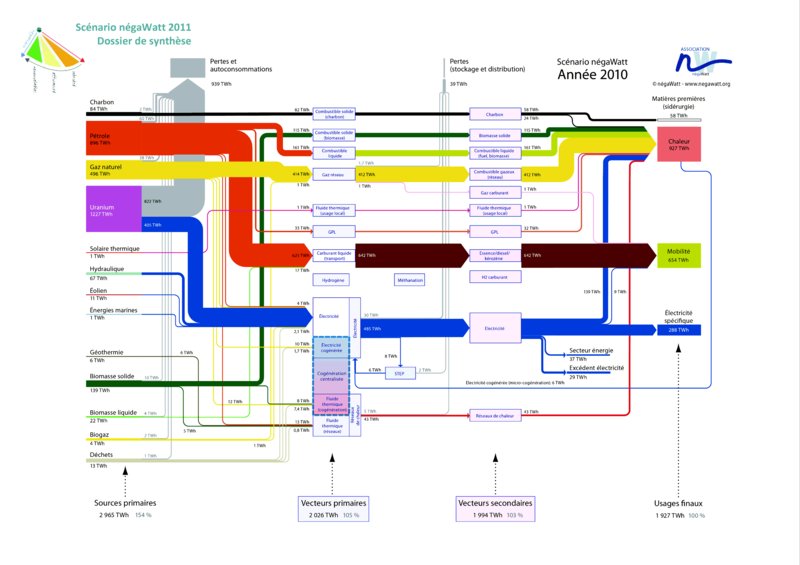 The Sankey diagram shows flows along the cereals production chain in France from the 2007/2008 harvesting campaign. Quantities are in 1000 tonnes. Different grains are shown on the left: wheat (‘blé’), hard wheat (‘blé dur’), maize, barley (‘orge’) and others. Two large end nodes for unprocessed grain exports and use as animal feed (‘consommation animale’). There are further exports as intermediate and processed products. Only a comparatively small fraction is consumed by humans in France as bread, pasta, biscuits. Could not detect use as energy crops, it is maybe hidden in the ‘industrial use’ flow. Anyway, an interesting application case for Sankey diagrams. French Négawatt association is advocating a changed attitude towards energy use, expressed in the three words “sobriété – efficacité – renouvelable” (translates as frugalness/modesty, effciency, renewables). On their website they show Sankey diagrams for a 2010 and a 2050 energy scenario. A simplified and a detailed version is available for both years. Below is the detailed 2010 version. Flows are in TWh. 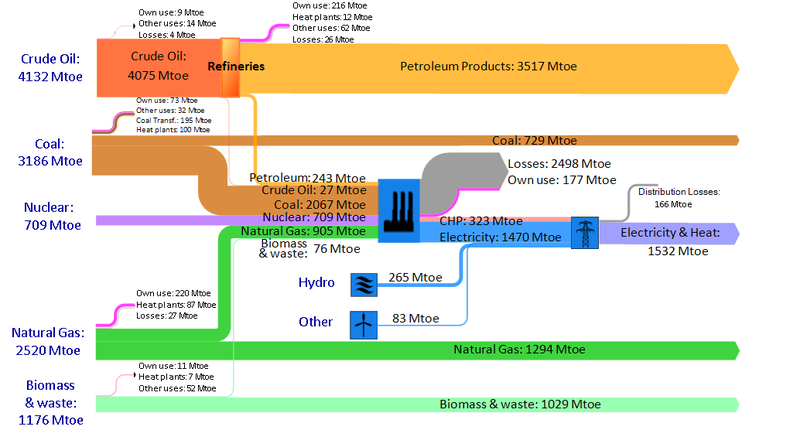 As common in this type of energy flow Sankey diagram they show in a left-to-right orientation the primary energy sources, energy conversion, and final use. Additionally there is a sum for each of the columns that tells us the overall energy efficiency: In 2010, to provide 1908 TWh energy to the users required 3009 TWh of primary energy (1,58:1).